An animated discussion about the future of robotics occurred at the September 24, 2011 Boulder Colorado Future Salon. One claim is that the last few decades in robotics might be analogous to the status of the computing industry in the 1950-1970s, growing slowly but surely, and suggesting that the pervasiveness and impact of robotics could start to accelerate. There has been significant progress in agricultural automation and factory automation, and this could spread rapidly to service industries and information technology industries. On the one hand this is the next logical step in fulfilling the ongoing human dream of using technology to provide more free time. On the other hand, while so far robotics has not had a big negative impact on jobs, a more rapid move to automation in more sectors could result in a more significant displacement of human capital. There is a tremendous opportunity to identify the industries of the future and start them. Future industries could be clustered by areas such as sustenance (food, energy, and clean resources), health, productive activity, entertainment, and well-being. One obvious group of future technologies will focus on food, for example, vertical farming and lab-grown meat. Mental well-being and enhancement is virtually untapped, although there is some preliminary activity in applying behavioral change and happiness research, and calming technologies. Some key dynamics that govern human behavior will not be going away in the short-term such as the demand for status-garnering and reputation-building (why gaming has been so successful), so industries providing opportunities for this would be well-pitched. Like email, instant messaging, and wikis, the latest newtech spreading into businesses is social networks, essentially serving as a private internal version of Facebook and Twitter. Enterprise social networks are used for a number of purposes, first and foremost, status updates to work teams, but also for real-time messaging with colleagues including document transfer, broadcast announcements, and opinion capture via polls. There are several companies in the enterprise social software sector (Gartner chart). Among the most vibrant are Yammer and Chatter (affiliated with salesforce) each of which has over 100,000 corporate customers in a wide range of industries from finance to entertainment to professional sports; Jive is a third large company in the space. The standard pricing model appears to be freemium-based, free for light-users and $5/seat/month for power users. Enterprise social networks are typically externally-hosted. Two of the key challenges that come to mind with enterprise social software are: consolidation with other internal communications platforms and data mining. As with enterprise instant messaging, archival and retrieval is important, both at the personal level (for productivity) and organization level (for information systems backup and compliance). There need to be effective ways to consolidate and mine multi-platform internal communications. Formalizing the explosion of casual interaction as it naturally occurs could be abstracted into value-added tools such as a codification of internal knowledge and expertise in the internal wiki for training purposes. It might also be possible to integrate communication flows unobtrusively and automatically into prediction markets or other sentiment analysis algorithms to capture opinion about key upcoming events like product launches and quarterly sales results. The human microbiome, comprising 10x human cells, is interesting not only for its significant role in determining health, disease, drug response, and individuality, but also in possibly being a less-invasive human augmentation substrate, for example, bringing nanoscale connectivity and memory processing modules onboard via the microbiome. Research extends beyond characterization - an investigation of perturbations to the human microbiome has shown resilience in recovery following a disturbance. However there is vulnerability with persistent perturbation. The human microbiome may not reassume its initial state unless the disturbance is at a frequency that the system has experienced before and for some time. In this case, the system may get stuck in an alternative state or local maximum. (paper). Time is familiar in the sense of the three space dimensions and the one time dimension around which human affairs in the physical world are organized. Additionally, each person has a subjective and identifiable relationship to time, even though this may be little more than a convenient construct. In science, time has been developed to the greatest degree in physics and cosmology, and in the philosophy of science. Other fields too are starting to consider time more robustly, including complexity, biology, and computation. The conference addressed the issue of the arrow of time from many perspectives. 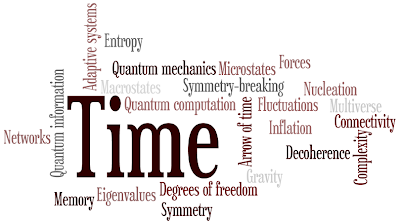 While most fundamental laws of nature are time-symmetric, some areas have a time arrow flowing in one direction such as thermodynamics, quantum theory, radiation, and gravity. This can be problematic to explain. A suggested analysis structure involving the trade-offs between complexity and entropy as systems evolve over time served as a useful model for analyzing different aspects of time throughout the meeting.